Mish's Global Economic Trend Analysis: Obama's Push to Expand Credit to "Credit Invisibles"
Obama's Push to Expand Credit to "Credit Invisibles"
A recently released government study by the Consumer Financial Protection Bureau on "Credit Invisibles" has some interesting facts on people with and without credit histories. Approximately 188.6 million Americans have credit records at one of the NCRAs that can be scored by the commercially-available model. This represents over 80 percent of the adult population. An additional 19.4 million Americans, representing 8.3 percent of the adult population, have credit records that cannot be scored. These are almost evenly split between consumers with credit records that are insufficient unscored (9.9 million) and those that are stale unscored (9.6 million). The remaining 11 percent of adults, or about 26 million Americans, are credit invisible. 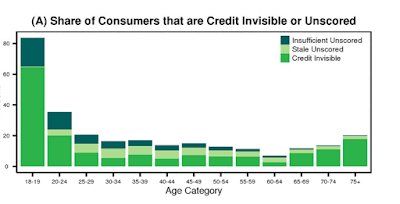 Over 80 percent of 18 or 19 year olds are credit invisible or have unscored records. This percentage drops substantially for older consumers, falling below 40 percent in total for the 20 to 24 year old age group. After age 60, the number of consumers that are credit invisible or that have an unscored record increases with age. Over 10 million of the estimated 26 million credit invisibles are younger than 25. Consumers in this age group also account for a disproportionate share of insufficient-unscored credit records. In contrast, most consumers with stale-unscored records are middle aged. Consumers aged between 25 and 50 account for over half of stale-unscored credit records. The study did not indicate how many of the 45 million (invisibles plus unscorables) are illegal aliens. But the name of the game as always is credit expansion. Investor's Business Daily discusses situation in Obama Pushing Banks Into Riskiest Borrower Pool Yet: 45 Million 'Unscorables'. Housing: As part of its amnesty program, the Obama regime seeks to expand credit to a whopping 45 million potential deadbeats — including illegal immigrants — whose credit files are too spotty even to score for risk. In a just-released federal report, the administration portrays these "credit invisibles" as victims of a traditional credit-scoring system. And since most are minorities, it claims that excluding them from the financial mainstream is discriminatory. "Our report found that black and Hispanic consumers are more likely than white or Asian consumers to have limited credit records," CFPB Director Richard Cordray said in a press call. But analysts say most of these "unscorables" are not creditworthy, and according to preliminary estimates, their median credit score falls well below the subprime cutoff (535 vs. 620). Public records show many are subject to third-party debt collection and tax liens. Lenders rely on the three-digit credit score as an indicator of how likely it is a borrower will repay a debt. Stale files or thin credit history does not allow FICO and other risk modelers to accurately predict future credit performance — that is, the likelihood, relative to other borrowers, that a consumer will become 90 or more days past due on a credit obligation in the following two years. Using "alternative" inputs in the models, such as utility payments and remittances, could water down the models and make credit scores less reliable, leading banks to make even riskier lending decisions. Part of the alleged credit injustice dates to 2010, when many of the provisions of the Credit Card Accountability, Responsibility, and Disclosure Act (CARD Act) took effect. After the CARD Act passed in 2009, consumers under age 21 had to prove they had a job or a co-signer to get a credit card. The goal was to keep younger consumers from taking on credit card debt they could not repay, he said, "but if you are going to restrict people from getting credit, you are also going to restrict their ability to build a credit report." Is that a real hardship to require a job or other source of documented income before giving someone a credit card or mortgage? Instead, CNBC offers this advice on rebuilding or establishing credit. Instead of granting credit to those with no jobs, teenagers who live at home, illegal aliens, and other non-creditworthy individuals, the CNBC advice seems reasonable enough. Instead, Obama wants another credit free-for-all to expand housing and car loans. Didn't we try that once already, with miserable results?